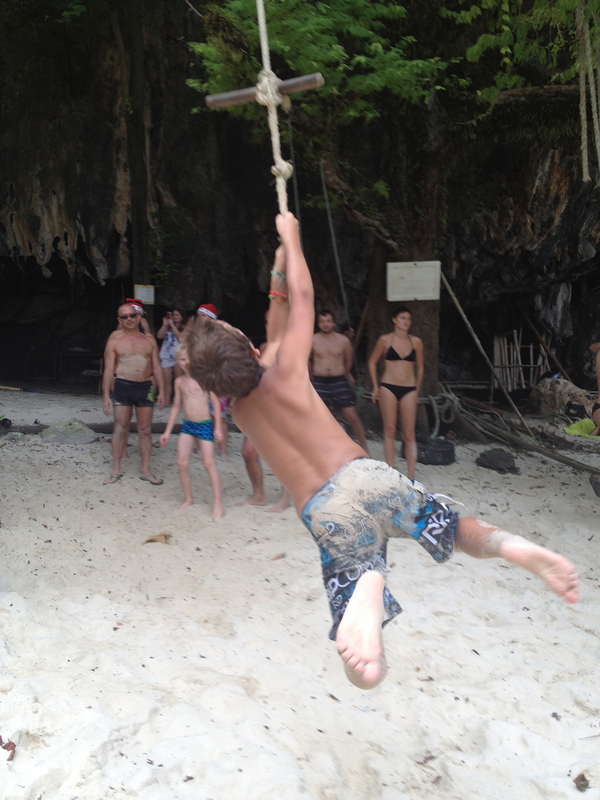 This year we spent another wonderful Christmas on the beaches of Ao Nang, Krabi. 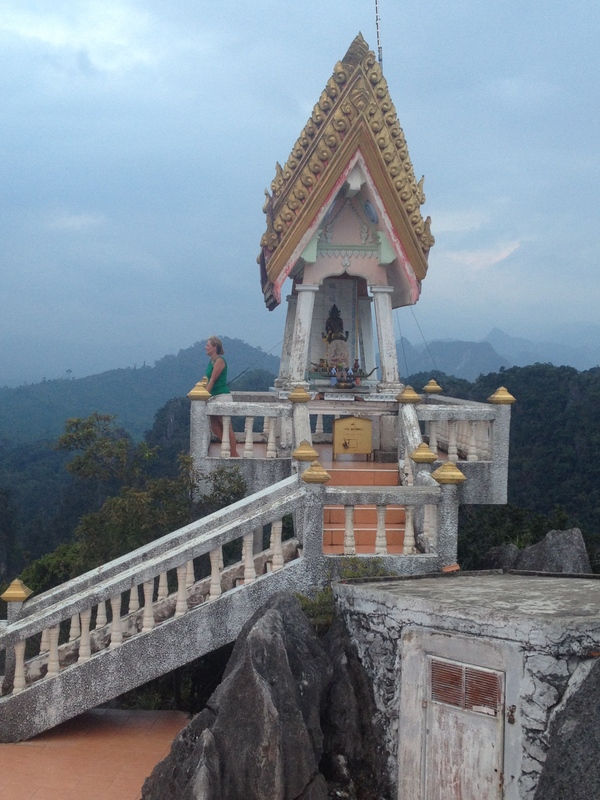 We rock-climbed, relaxed in the ocean, and on the fabulous beaches, slept in the jungle at the base of Spirit Mountain (Chong Phli)….where we woke up to the sounds of a rooster and some monkeys….and learned to live with colonies of ants and some scorpions. It was different from last year in that we got to share each beautiful day with a Brie, Björn, Luka and Zora; a wonderful travelling family from the US that we had met in Cusco, Peru (they were at the start of their Southeast Asian exploration…sorry you weren’t with us GiGi)! 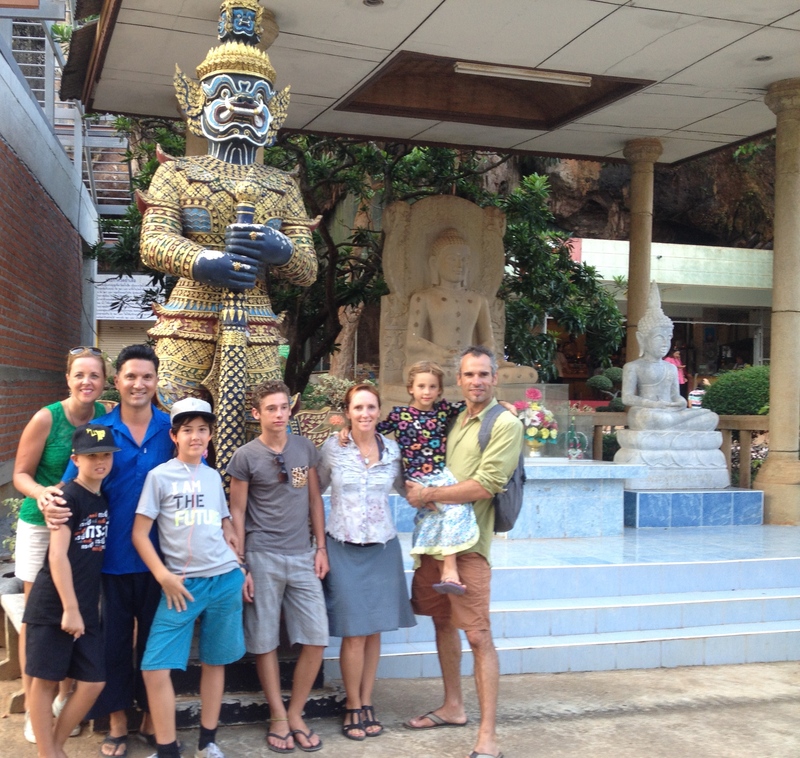 Our one cultural visit, was a motorcycle ride to the Buddhist Tiger Cave Temple, locally called Wat Tham Suea. 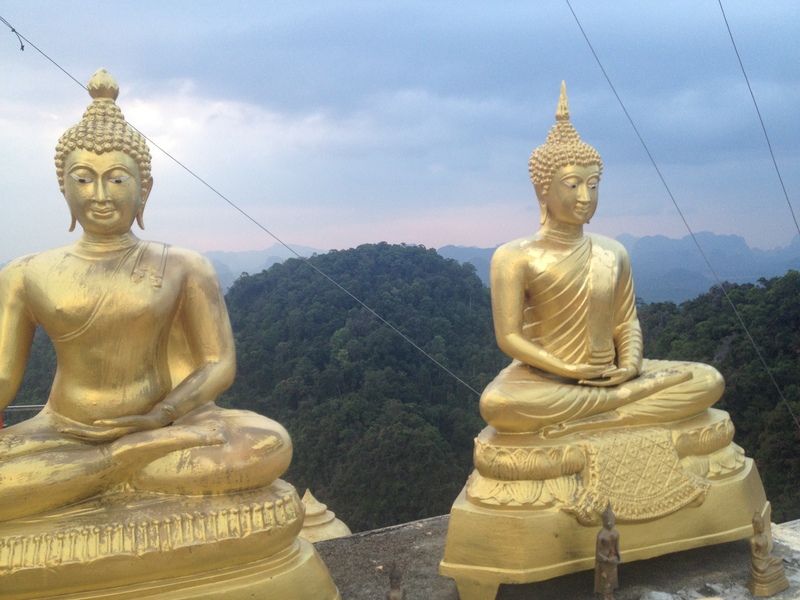 What is appealing about visiting Wat Tham Suea is that it’s one of the most sacred sites in the province and an active meditation hub where monks live and worship. 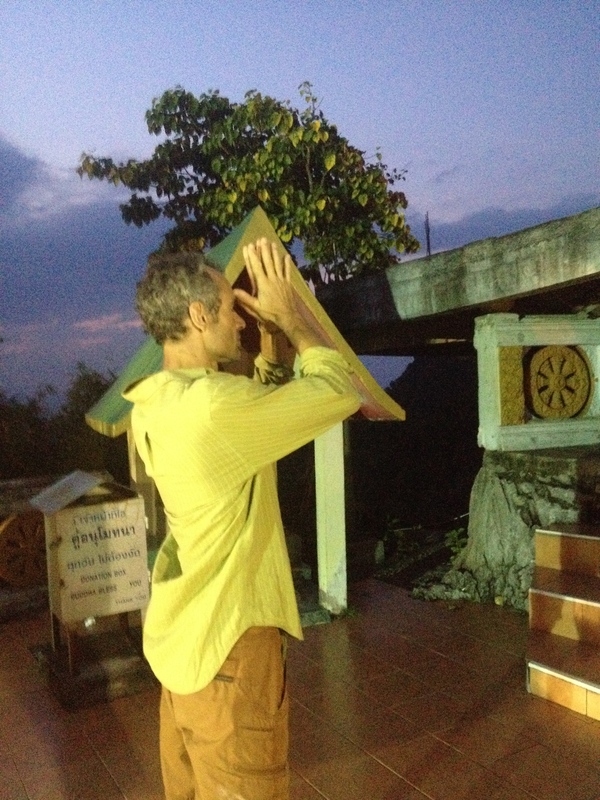 According, to our friend Michael who lives in Krabi… definitely one of the more interesting temple complexes in southern Thailand. 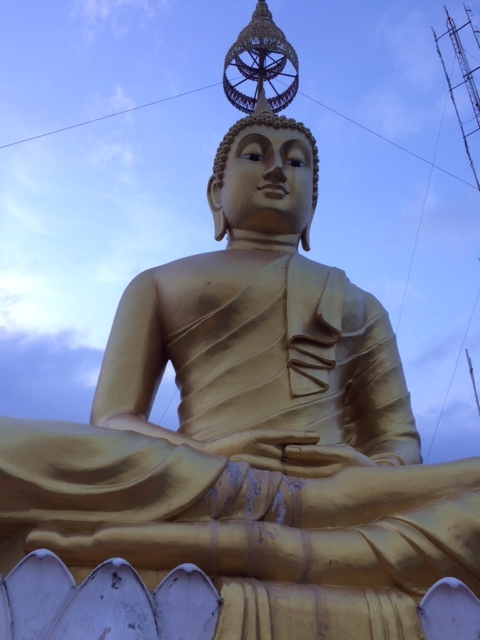 So off we went on our scooters….in search of wisdom and enlightenment! 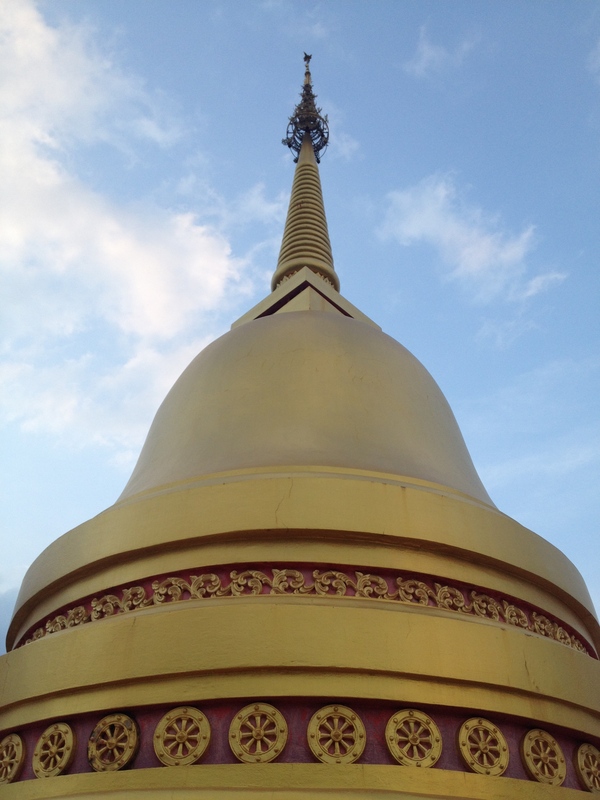 This golden temple is located about 3 km outside of Krabi Town, and as we slowly we approached it, we saw what looked like a tiny, shiny statue on top of a tall mountain. Filou kept asking me, if I was serious about us hiking up to this structure, so high up in the sky….but of course, I am! (trying to convince him that there might be an elevator, didn’t fool him – he knows better by now). Western places of worship tend to be centrally located and somber in colour. 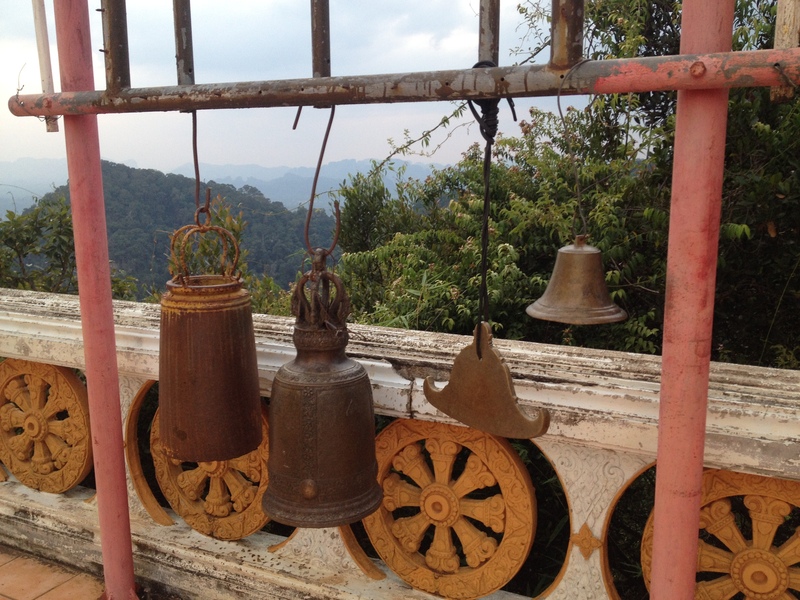 In contrast, Thai temples are further removed and often located on mountains and in caves. They are very colourful in nature, often ”guarded” by brightly painted animals…a real focus of artistic endeavours (you’ll find unique architecture, sculptures, paintings, decorative arts and crafts in these locations). The Tiger Cave Temple was no exception! 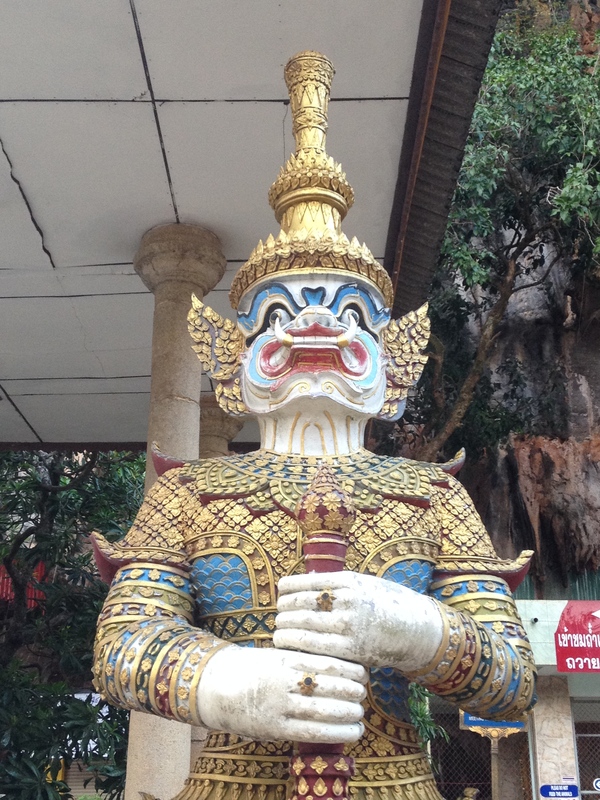 Tiger Cave Temple or Wat Tham Suea. Statue of Buddhist monk with golden tiger. 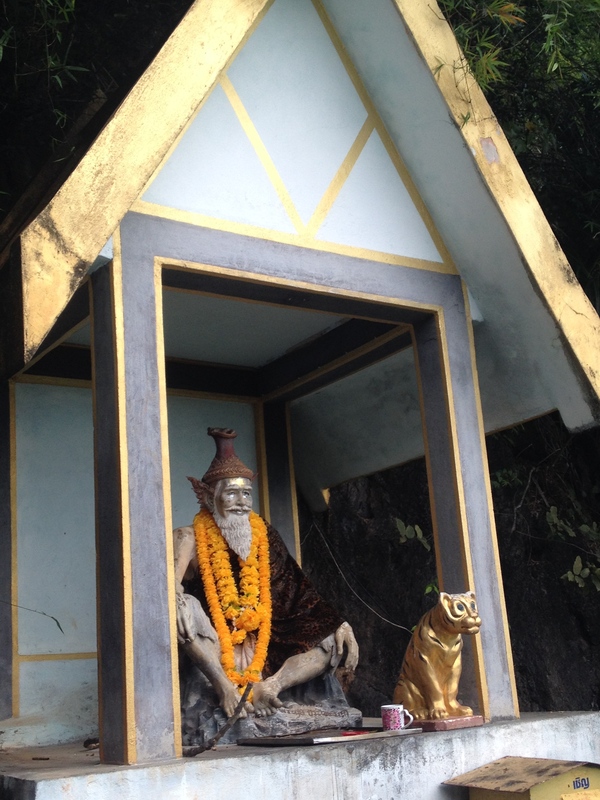 Apparently, Wat Tham Suea (which dates back to 1975), got its name TIGER temple because of a monk named Jumnean, who went to meditate under the cave and witnessed tigers roaming around. Another legend talks about a huge tiger living in these caves in previous times. Tiger paw prints can be found on some of the cave walls and the bulge of the cave also resembles a tiger’s paw. Besides tiger paw prints, many unique artifacts (stone tools, pottery remains and Buddha footprints) were found around these caves and temple grounds, which makes this an archeological site of interest…however, we were most drawn to climbing the limestone tower, so we could witness the “footprint of the Buddha” and the largest bell tower in southern Thailand. So off we were, for our hike to the top. 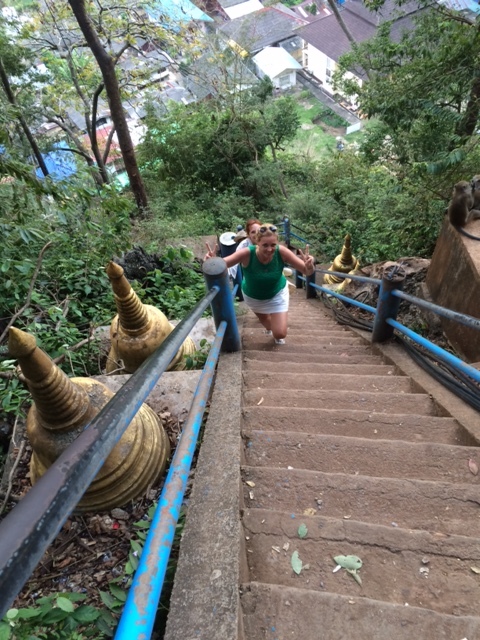 We consider ourselves to be in decent shape (after the many hikes we have done in the past year), but the heat (we chose to go only at 4:30 pm) and the 1260 steps to reach the top (some quite steep ones), made this quite the interesting climb up…. The stairs to the mountain-top shrine are surrounded by lush vegetation. We weren’t even walking for 5 minutes when large monkeys were surrounding us everywhere. This meant a couple of deep breaths, as these creatures might look cute but can indeed be quite vicious. Björn and I. Me with my beet red face (not a sunburn… but the energy from walking up 1260 steps…still smiling though!). 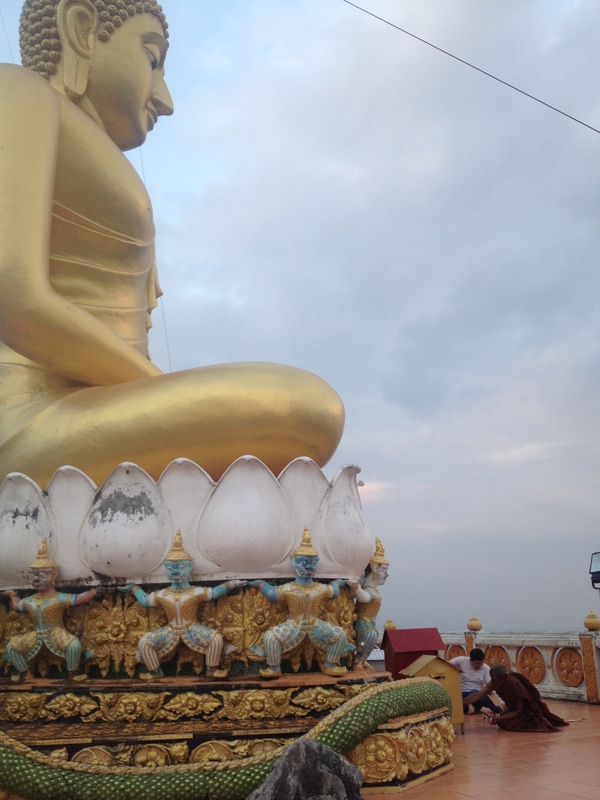 And of course, besides the views there was the huge golden Buddha statue, standing 278 meters tall….as well as several shrines, statues with interesting symbols such as snakes, and antique looking gong bells. The locals and monks were praying and showing us some of their rituals. Most local temples are off limit to visitors, so we felt thankful to have had this experience. And so when the sun was setting and it was slowly getting dark, we made our way back down the 1260 steps with a peaceful mind. With a delicious dinner alongside the river, at the Krabi night market, we said good-bye to our wonderful friends and another great stay in Oa Nang. I look around & see detailed stories & mini films that continually replay themselves in my head; the vendor lady in Bolivia with her incredibly, colourful tablecloths & scarves, Filou happily strolling The Great Wall of China, Anthony enjoying his favorite coffee in Vietnam, the gorgeous sunset over Angkor Wat in Cambodia, the gorgeous, little girl in her traditional Chiang Mai, Thailand outfit, Emile swimming with turtles and sea lions in the Galapagos Islands and me, paragliding in Canoa, Ecuador: snapshots of some unbelievable memories that put a great, big, happy grin on my face. I’ve just come back from the photo shop where I printed about two-dozen pictures, to give our new home in Bangkok that personal touch. Still daily, our family reminisces about the amazing life memories we’ve created together this year. The beginning of 2014 was the start of the 2nd. half of our trip around the world. 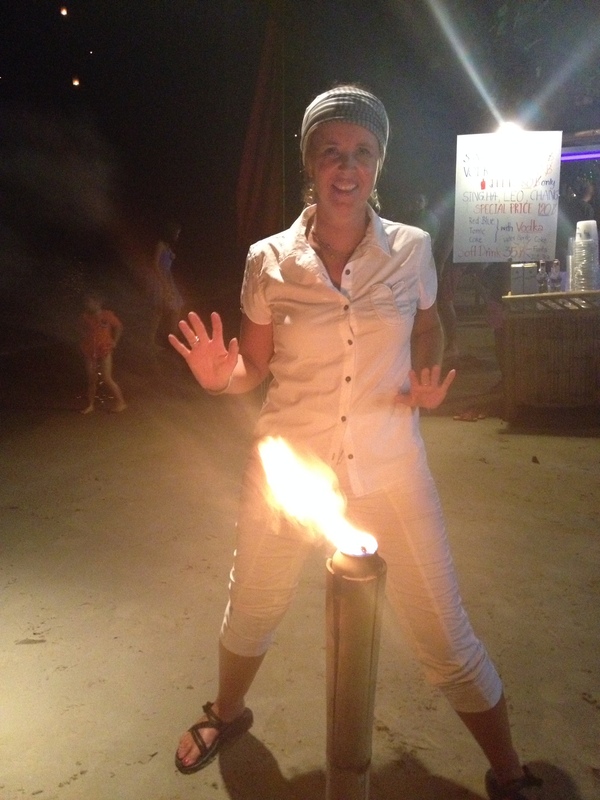 It was on the beach of Krabi, Thailand that we rang in the New Year (and made a wish that one day we would come back here…I guess be careful what you wish for!). 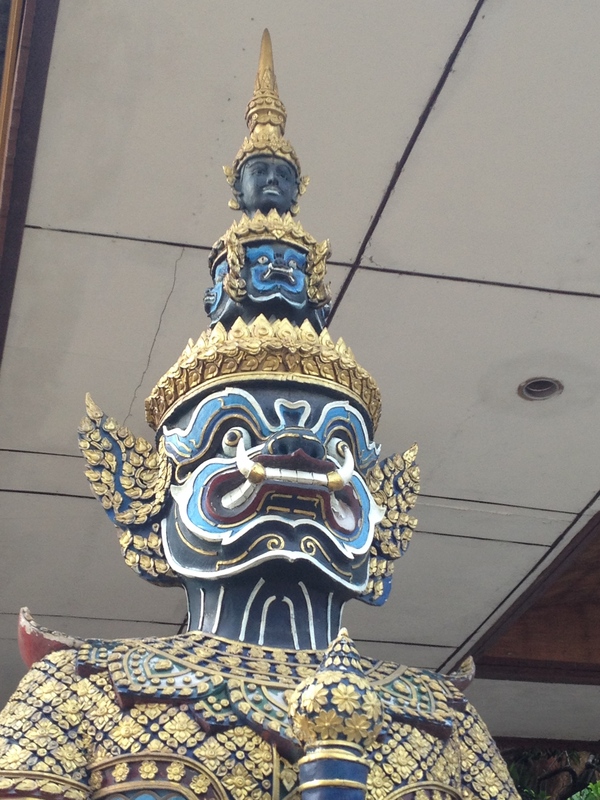 After a fantastic month of “beach bum” life & making new friends, we moved on to Chiang Mai. It was here that our (grand)fathers joined us for 2.5 weeks. 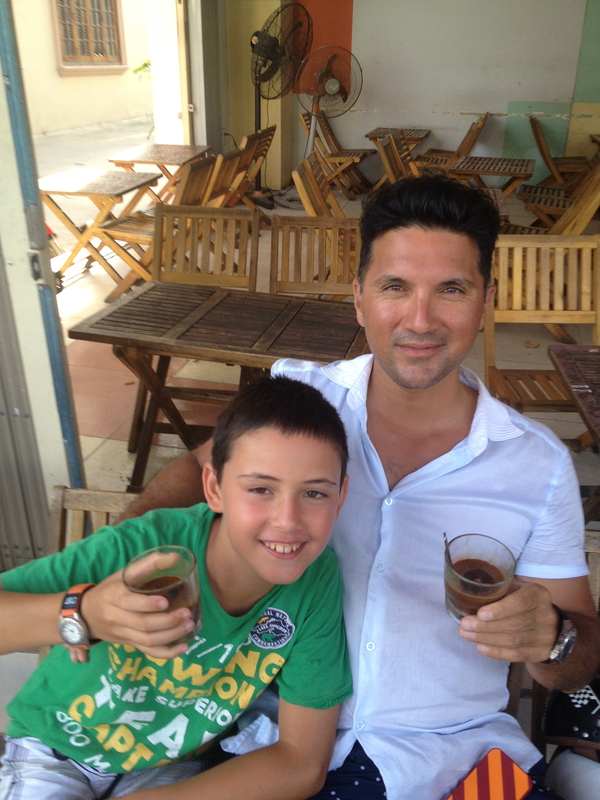 What a joy for Emile and Filou to have their Opa from Holland and Jichan from Canada together, and share in a bit of their unique, world-schooling, travelling life. Then it was onto Malaysia, New Zealand and the Fiji Islands. 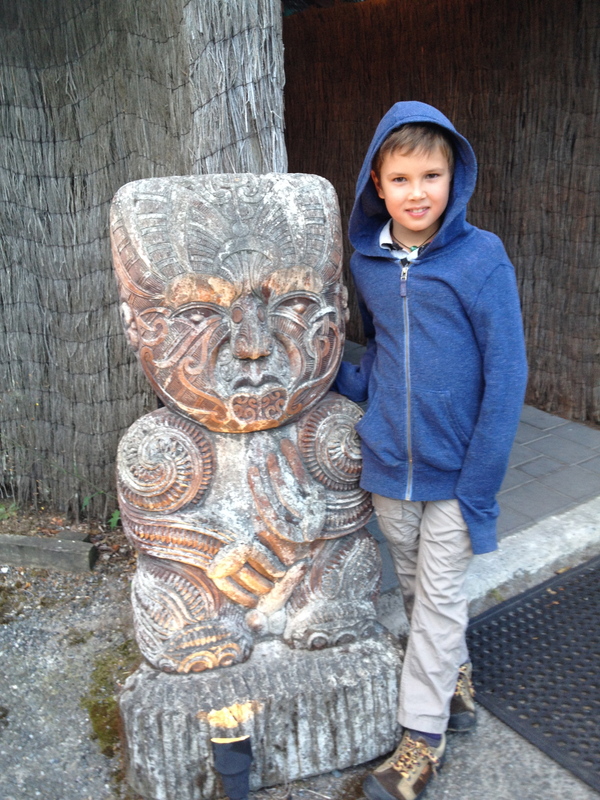 The land of the Kiwis was probably our favorite one from that line-up; learning about the fascinating Maori aboriginal culture, seeing erupting volcano’s and hot springs, and eating delicious lamb. Definitely a country to return to one day! It reminded us very much of back home…incredible nature scenes, delicious fresh produce & foods, and a warm & friendly people. Our longest, transatlantic flight was from SE Asia, via Los Angeles to South-America. A week-long stopover in the US gave us the opportunity to reconnect with grandma YiaYia and uncle Nuno. We had great fun together bowling, singing karaoke, and taking nature walks. 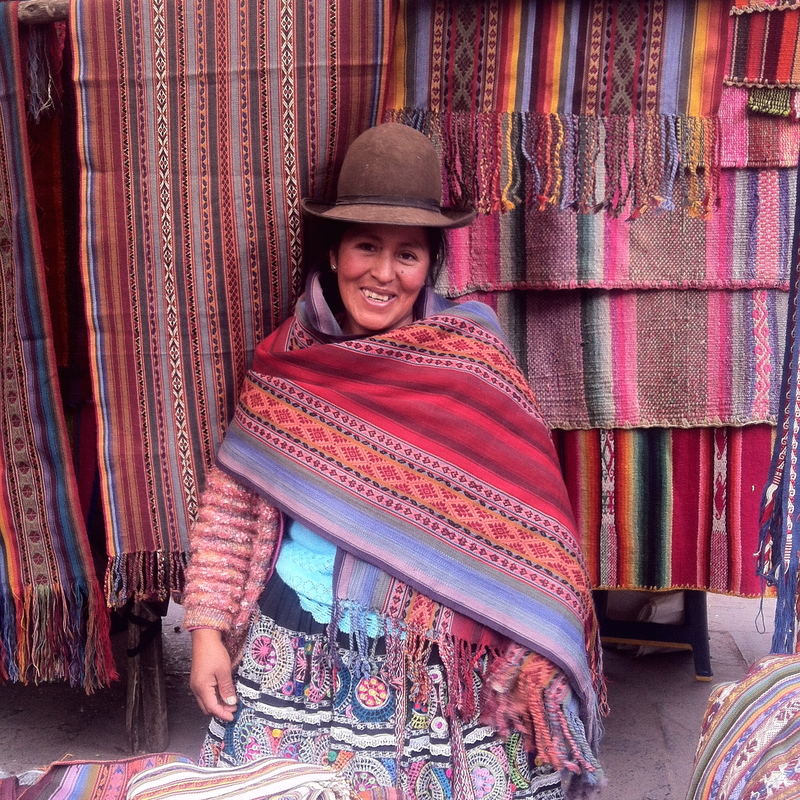 After touchdown in South-America, we headed to Cusco, Peru – a lovely high-altitude town surrounded by breathtaking ruins and the gorgeous Andes mountain range. The cold weather (no indoor heating) made us put our “adjustment” hats on a bit, but the warmth of the colourful, local people & wonderful friendships with several expat families, turned our stay into a very memorable one. 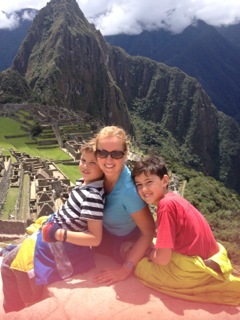 And of course, seeing the UNESCO World Heritage Site of Machu Picchu was pretty sweet! Then, we travelled by bus to rugged Bolivia with its incredible Uyuni Salt Flats and gorgeous Lake Titicaca. 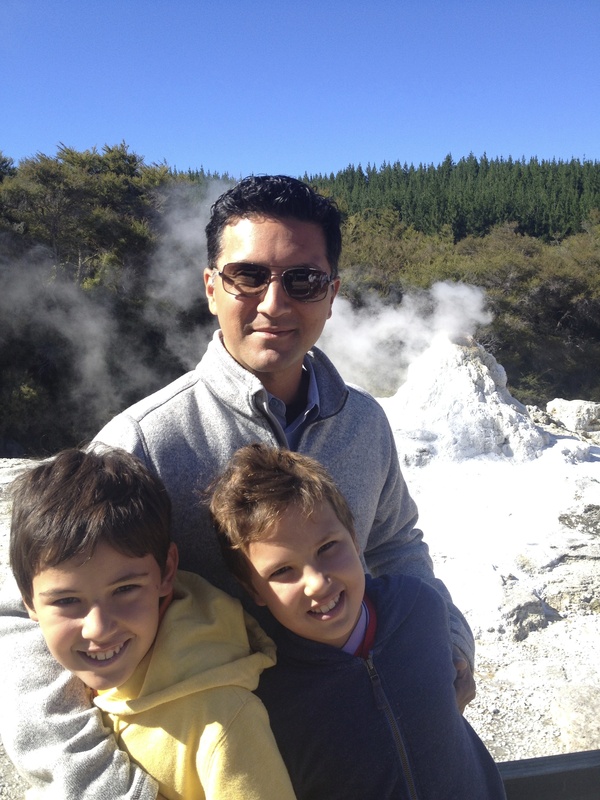 But South America’s highlight for the family was definitely Ecuador & the Galapagos Islands. We went out with a BIG BANG! Who gets to swim with sharks, giant tortoises and sea lions, jump off a cliff to go skydiving, fly in a 6-seater plane with the windows open, get close to the very rare blue footed boobies or experience world cup soccer in a beach shack with Ecuadorian Futbol fans & the very best of newly-made international buddies? It really doesn’t get any better….and our entire trip was just like that; a phenomenal dream come true. It is without a doubt that the year 2013/2014 will forever be engraved in our family’s mind as a special one! Our world trip ended in mid July, but we couldn’t quite leave the adventure behind…and so after 5 incredible weeks with family back in Canada – re-appreciating our country and taking in the incredible orderliness, cleanliness and calmness – we took off again. 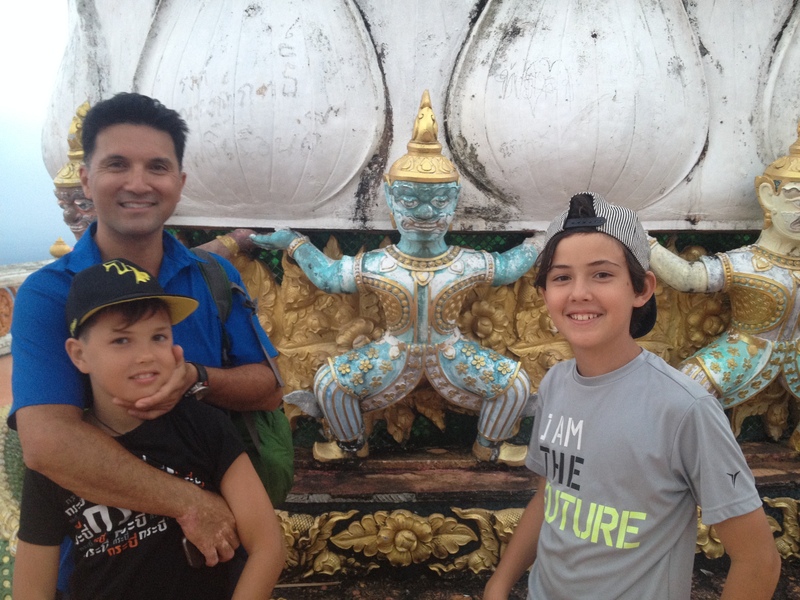 This time to settle in Bangkok, Thailand; the place that was our family’s favorite and the perfect location from which Anthony could explore new business opportunities in the ASEAN region. It’s been close to 4 months that we’ve been living in the Land of Smiles now…and we all love being in Asia. The sun is priceless; no snow shovelling, snowsuits, hats or scarves! Although I have to admit, it’s sometimes even too hot for this sun worshipper….but the winter months of Dec. & Jan are perfect…and we get to enjoy our pool often! The food here is plentiful, full of variety and scrumptious. Every morning we wake up with a mango smoothie, made from the sweetest fruits you’ve ever tasted. Personally, I’ve become addicted to pomelo; a type of Chinese grapefruit….but so sweet and juicy. And Anthony…well, I don’t have to cook for him anymore; he has developed a love relationship with the street vendors! He goes for the simple chicken & rice dish (Khao Man Gai), even tolerates the very spicy sauce that comes with….and he often eats Lap Moo on our street (which is lined with about 6 different vendors each evening). This is a spicy ground pork & toasted rice dish that comes with anis, cucumbers & green onions. His absolute favourite! The rest of the family has also taken to Bangkok’s fabulous street food. Emile devours the most amazing grilled crab on the street and Filou loves his rice-paper wrapped salad rolls (he’s still our salad king! )….and me? Well, I’ve found an award-winning place for Chicken Pad Thai – don’t tell the rest of the family but I go there often by myself during the day….it’s just too good and for $3.00, what’s not to love? We all really enjoy the area we live in – 59 Sukhumvit (& Thonglor). Apparently, the Thonglor area is somewhat of a hip area to reside in. We had no idea, but are happy to be in this very Japanese influenced neighbourhood. So many great grocery stores (the Japanese really know how to do the best fresh fish)…. and of course it has many fabulous restaurants for us sushi lovers. We quickly learned how to say 59 or haa sip gao (actually Emile learned it at school and taught us)… as the first two weeks in Bangkok, we had a hell of a time getting a taxi driver to take us home. The kids did not have school transportation yet, and so we stood on many a hot street corner smiling and waving – hoping someone would take us home to the right location. The traffic in Bangkok is a nightmare although the Skytrain system is fabulous and so we mostly use this BTS system to get around. And of course, then there are the minibuses that pick Emile and Filou up each morning at 7 am to go to school. 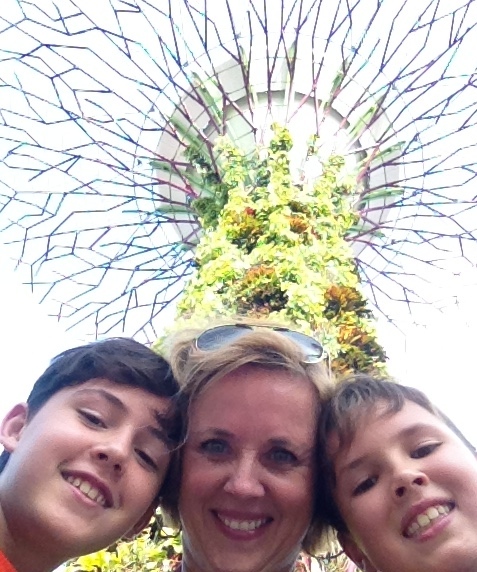 Days are long and full of new learnings for the boys at their new school: Lycée Français International de Bangkok (http://www.lfib.ac.th). After some initial adjustments (getting used to being in school again, kids making fun of their different French accent, learning how to write cursive as the French LOVE their “lettres attachées” etc. ), the boys are thriving! Emile is in Première with lots of autonomy – he’s on top of his homework, his changing class schedule & acing his subjects. But more importantly, he is making lots of friends – mostly because of his newfound love for Ping Pong (the kids play every chance they get at school), and his continued love for soccer. He qualified for the “Coupe d’Asie” soccer team & will be competing against teams in the region. He has also started a rock band called “Rock Storm”. As the lead singer & guitarist, he’s working hard towards a grand finale, year-end performance. Très cool! Filou remains our social butterfly & quickly made tons of new friends at school. He’s also working hard academically & has become the Lycée’s “billes” champion. Marbles is what turns his crank at the moment, and of course; playing music. He still loves his piano & is now taking lessons at a high-tech music studio where he learns to play by ear using animations & computers, under the guidance of a qualified Thai teacher. 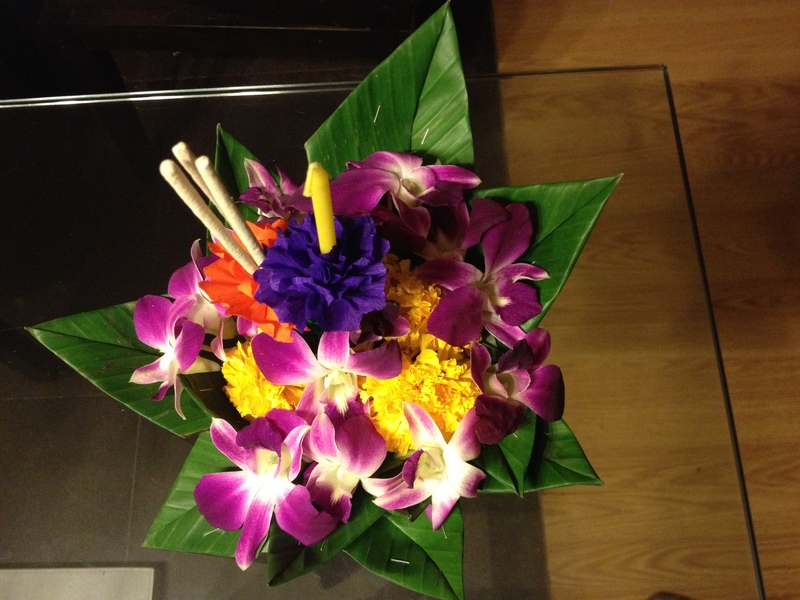 As a family, we’ve already taken in some wonderful local festivals such as Loy Krathong (Nov. 6). Loy means to float and a Krathong is a small boat made out of banana leaves & lotus flowers, decorated with candles & incents. 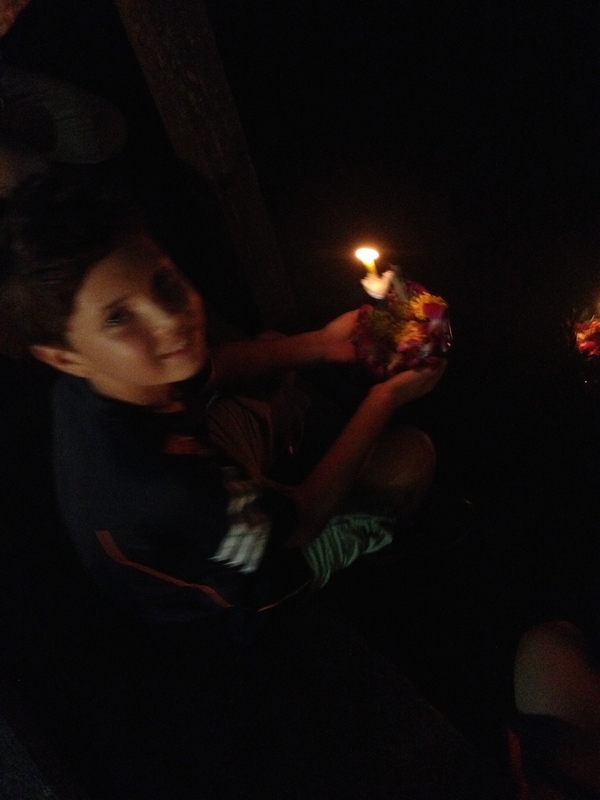 We took a boat tour in the Klongs, made our own Krathongs and send our creations onto the lake at night (to ask forgiveness and thanks to the God of the Water or “Mae Khong Kha”). We even put a piece of our hair and nails in our Kratongs like the Thais do….this will take all bad energies away and make for a good year ahead! And recently, on December 5, we celebrated the King’s birthday – also knows as Father’s Day. King Rama 9 or his Majesty King Bhumibol Adulyadej was born on Dec. 5 in 1927, so this day has become one of great celebration for the Thais, who absolutely adore & respect their King. This great man, who has worked incessantly to create a better life for Thai people everywhere, was unfortunately too sick for a birthday speech this year – but regardless, the streets were flooded with people wearing yellow t-shirts to pay homage (yellow is the colour of Monday – the day of the week the King was born on). And we’ve all travelled to Singapore to arrange for our new Thai visa permits. 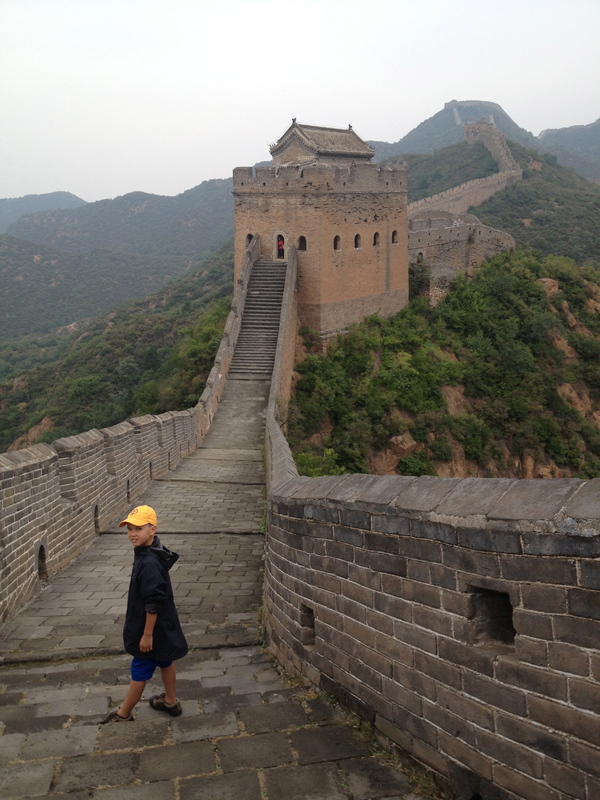 It was a fantastic week of sightseeing….and with our newly acquired papers in hand Anthony was able to set up his new company – Asia Clean Innovations or ACI (http://www.asiacleaninnovations.com). Last week, he moved with 4 Thai staff members into his new office & is very busy travelling the ASEAN region, speaking and making connections. 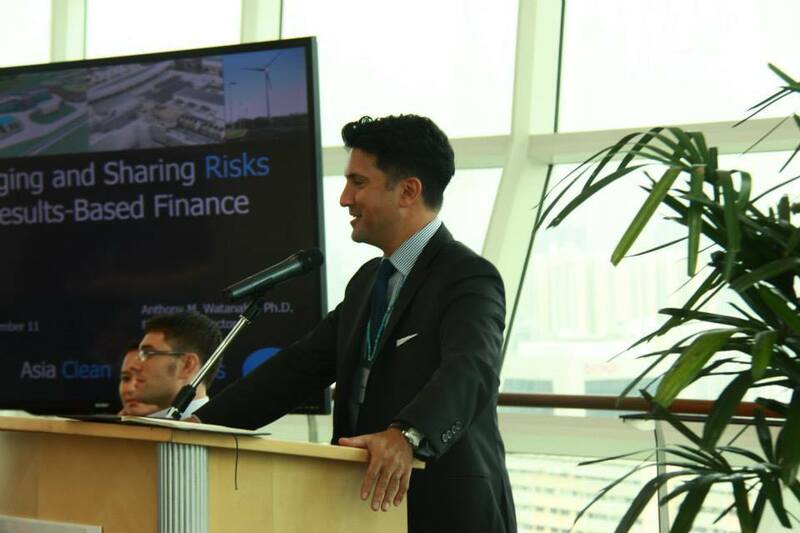 There are many good opportunities for him to bring Western Clean Technologies to the region and he loves the work in this quickly developing marketplace. 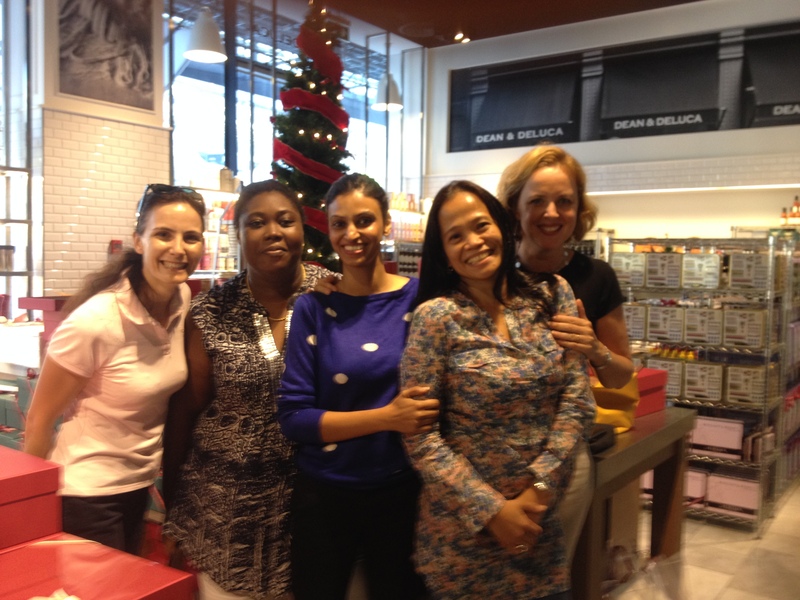 I have immersed myself in what “expat life” for women here is all about. I help to raise money for various causes, play tennis, get motivated by a fantastic Thai personal trainer 2x a week, socialize (my new friends are warm, interesting women who are a true reflection of the United Nations; Canadian, French, Dutch, Filipino, Indian, Congolese, American etc. 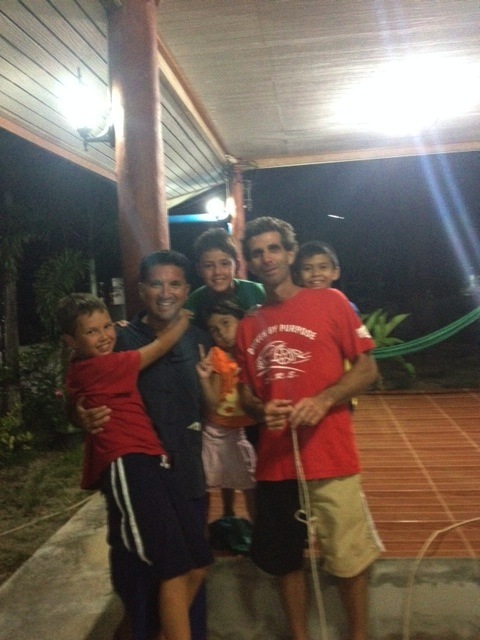 ), I network…..and spend lots of time with the kids. Also, I’ve started my own online jewelry business: http://mysilpada.ca/rose.swagemakers and contribute to an on-line magazine called Wanderlust: Expat life & Style. 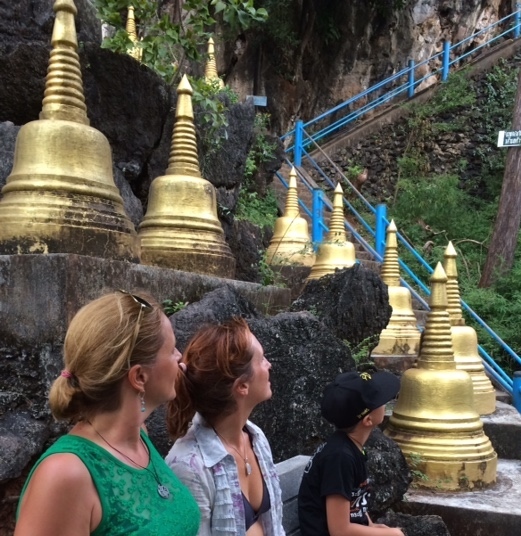 Our family and trip around the world was actually featured in their latest edition: http://www.joomag.com/magazine/wanderlust-expat-life-style-in-thailand-december-2014-january-2015/0084451001417429450/p46?short. So life is all good, although we also had some challenges back home this year…..In Holland, we lost our Uncle Guus and recently our very beloved Aunt Else, whose brave battle with breast cancer ended. In Canada, our Uncle Terry went through some major operations – and thanks to his lovely wife Berengère was given a second chance at life. But the hardest was not being able to be there for our sweet brother James who had a major stomach operation. Thank goodness, all went well and he is making great progress to a full recovery….with of course the loving care of Ayako & Betsy. His bravery is inspiring! Also both our mothers are dealing with some health challenges that we are monitoring closely…when it comes to this, being afar is not always easy! 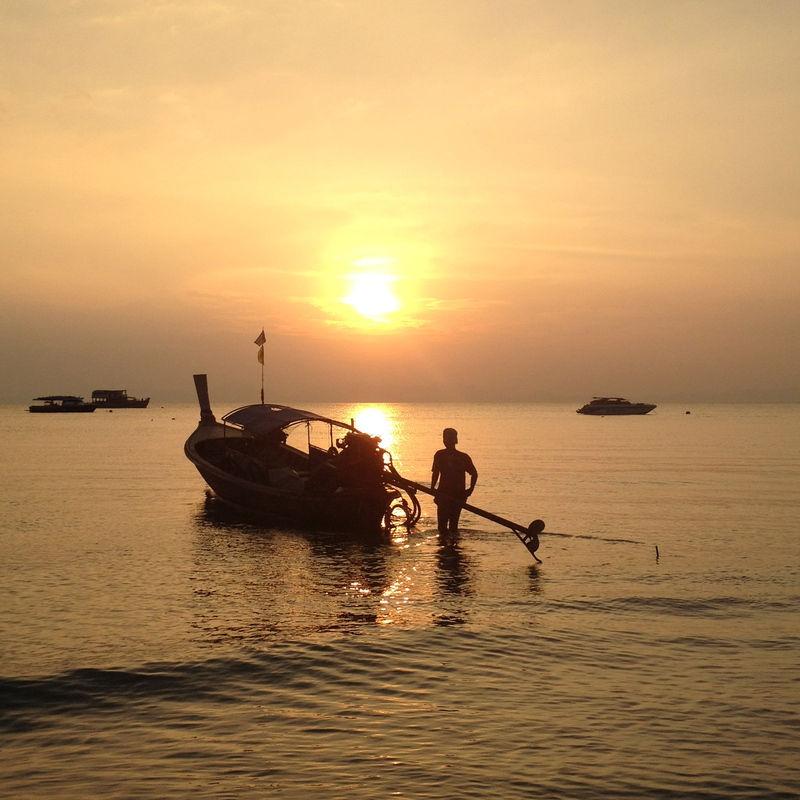 But we will finalize 2014 on a great note and will end the year in the same way that we started it….being happy & grateful on the beach of Krabi, Thailand. We wish you all a very happy & healthy 2015. May all your dreams come true like they have for us this past year! We always love to hear from you…and in case you want to follow our continued adventures, go to https://yolomomonthego.wordpress.com (and click the “follow” button). It is in meeting fun or inspiring people along your travel path that sometimes define where you’re heading next. So too in this case! 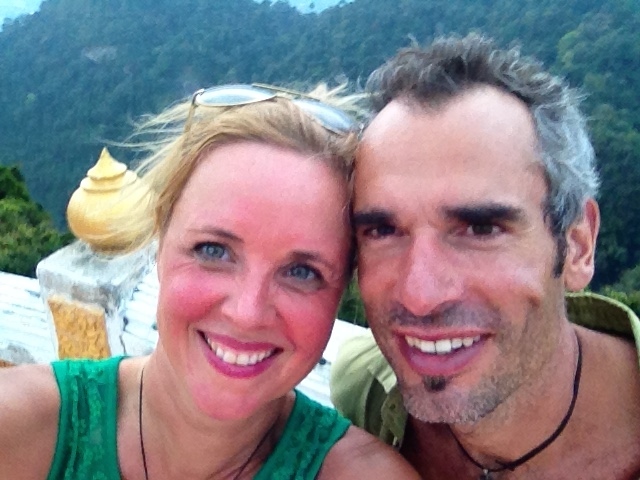 We met Michael….. an all-around, nice American guy, avid rock climber & Tai Chi enthusiast in Yangshuo, China. After some lovely chats, he convinced us that his hometown of Ao Nang, Krabi would be a great place to settle in Thailand for a while. 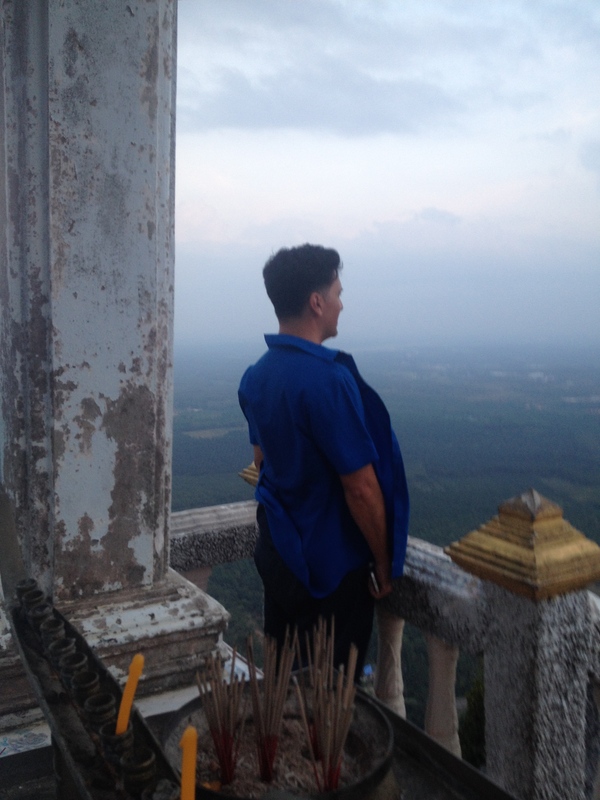 So off we were to Southern Thailand – a country so very near to our hearts as it was here that Anthony proposed to me over 20 years ago (most romantic proposal ever to boot!!). We couldn’t wait to get back and observe how this lovely country had changed during this time, and see if we still LOVED it as much as we did then! 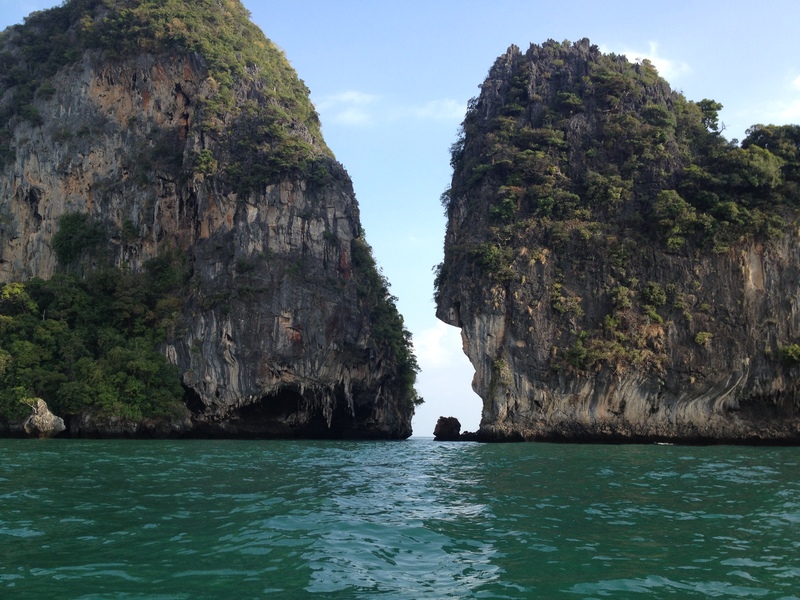 We arrived in Krabi on Dec. 15 – shortly before the holiday season. We rented a room in the comfortable 3 Bees Guesthouse (http://www.3beesguesthouse.com) and got us a set of motorcycles, allowing us to find a house for rent, for the month. I was a bit concerned showing up so close to Christmas with still a place to find, and rightly so. We scootered around for 2 full days in 30-35C, stopping at each hotel, hostel, apartment building and house – trying to find something to rent. We only got NO’s – FULL! At one point on day 2 on the scooter, the heat was starting to get to me so I stripped down to my bikini, sprayed myself with water and started to sing loudly (to keep the spirits up!! 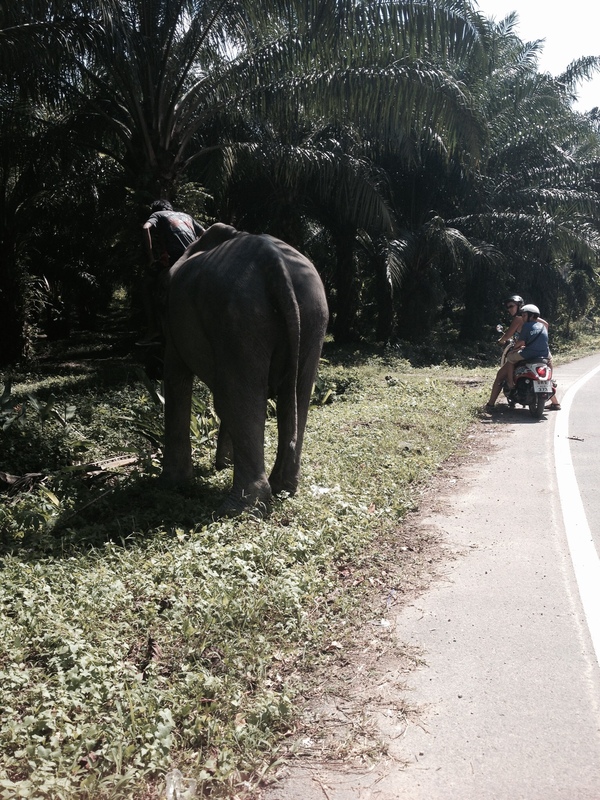 )…..when I turned a corner, I almost hit a huge elephant!!! Surely, I was starting to hallucinate! The kids were laughing at my erratic behavior, probably thinking that I was going to be certifiable soon …..but when I stopped and focused in, I realized I was not quite ready yet for the loony bin. This is Thailand after all! 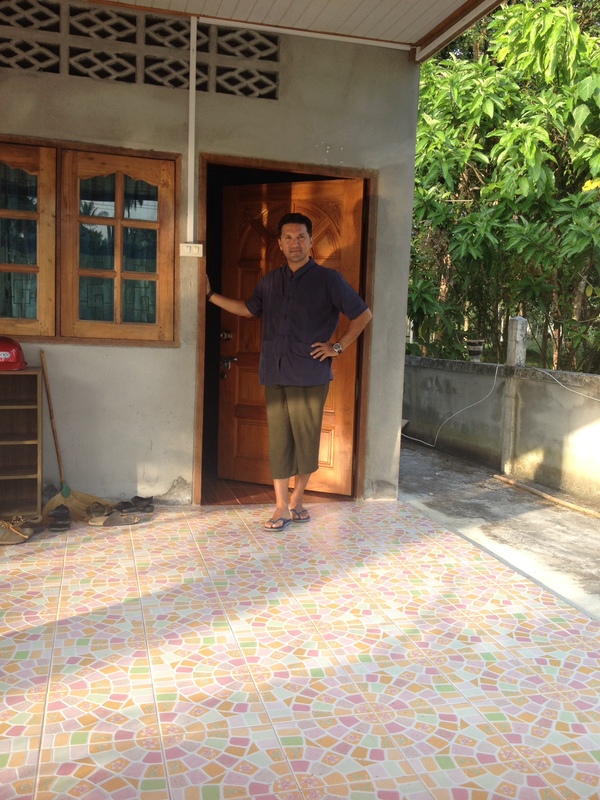 With the assistance of Michael, we ended up finding a great, 3-bedroom, Thai style house in the charming village of Chong Phli, just on the outskirts of Ao Nang ($400/month!). We loved living surrounded by locals (mostly Thai Muslims), riding our motorcycles everywhere and taking in the local vibe. 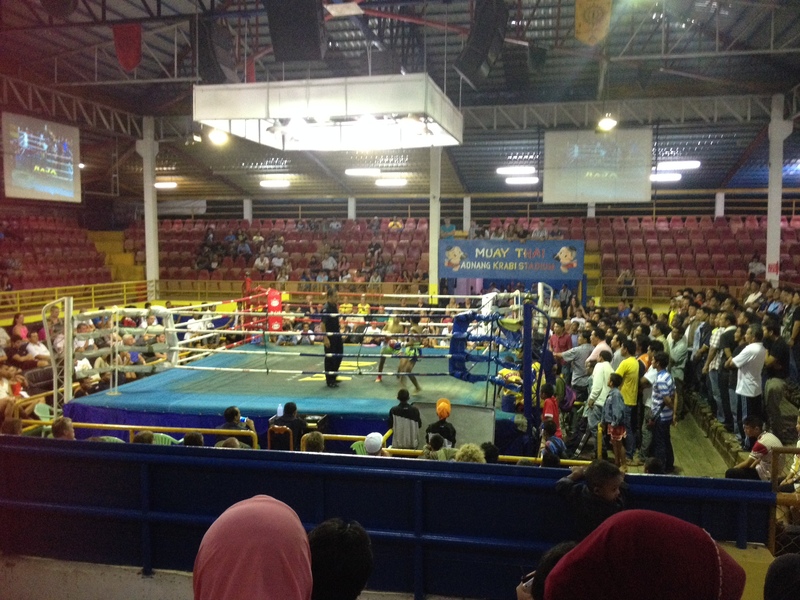 Anthony for example, went to cheer on our neighbor Son – a local Thai boxing champion in the 60Kg category – at one of his matches. He drove to the spectacle with him and his family and after a great time at the ring – he had a lovely chat with these fine people on the porch of their house. And, we quickly started to connect with and frequent the local Muslim women with their delicious food – our morning lady, who would drive by with her food cart offering us delicious crunchy chicken on a stick, rice curry, sesame balls or sticky rice in palm leaves with sweet coconut…or the lady with the best chicken & rice with spicy ginger sauce for dinner… All for $1-2 per dish. 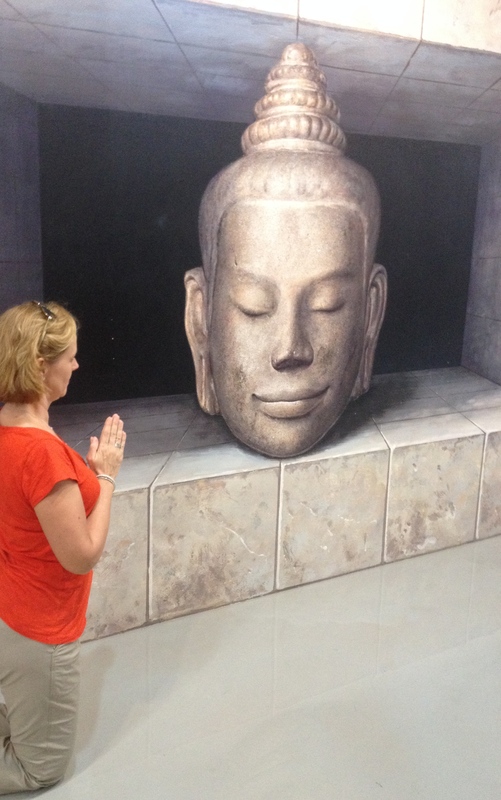 As Emile said, when you are in Thailand, eat like the Thais do….And so we did – without any hesitation!!! as Thai cuisine is so fresh, varied, delicious and incredibly cheap! 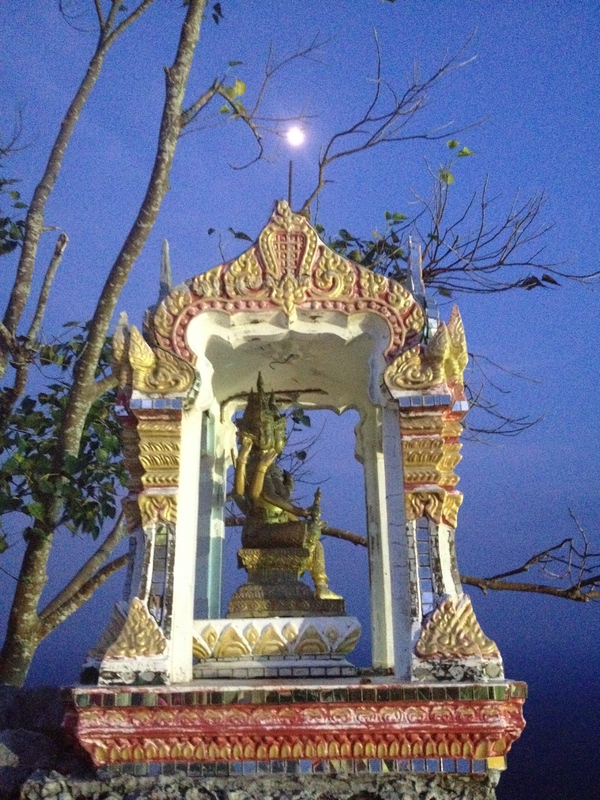 Ao Nang is one of the top destinations in Krabi Province and we quickly noticed why. This bustling, touristy town is the gateway to some of the most beautiful and top rated beaches and islands in the world (such as Railay, Kho Lanta, Hong & Kho Phi Phi Islands etc.). In addition, Ao Nang is surrounded by the most stunning rock formations making it a top destination for rock climbing (and the sunsets – WOW)! 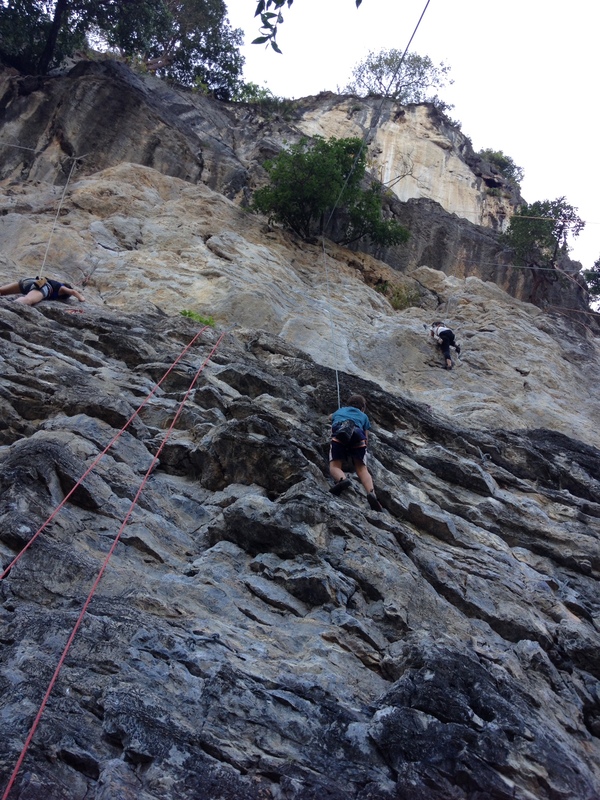 After his first thrilling experience in China, Anthony was eager to continue learning to rock climb! 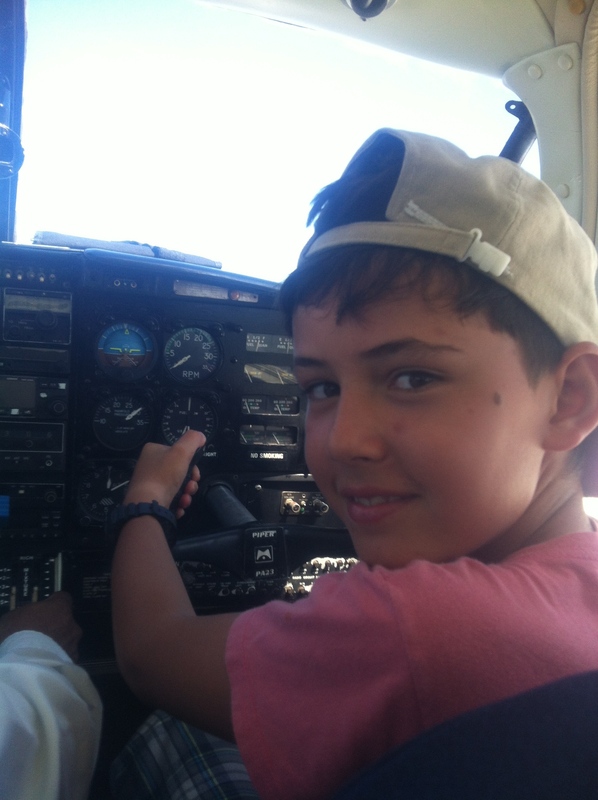 With Michael by his side – he got a chance to go out several times and improve his skills. 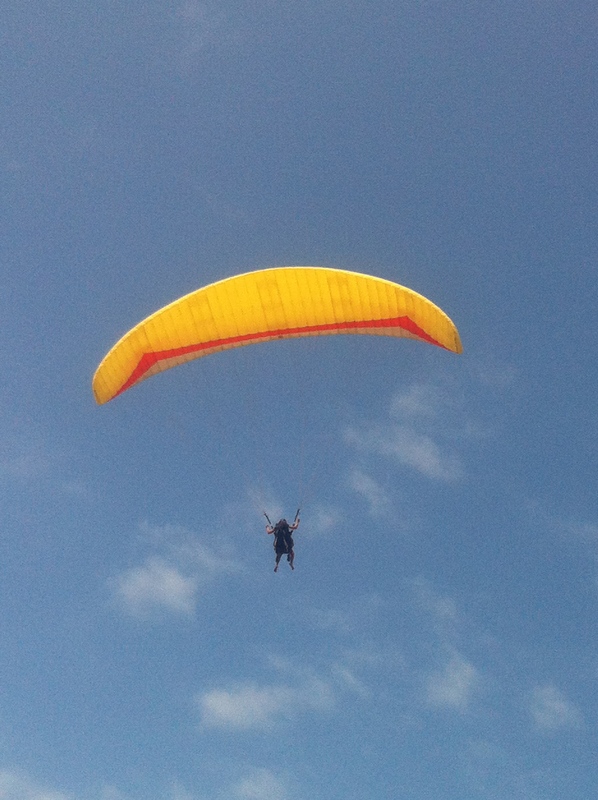 Often, my brave husband came back with cuts and bruises but always in great spirits, loving his new hobby! Emile & Filou also quite enjoyed this new sport and took several rock climbing classes on beautiful Tonsai Island, called Basecamp Tonsai (http://www.basecamptonsai.com). This climbing company did not only expertly guide novices to climb the beautiful rocks in Ao Nang, it also housed a wonderful rooftop café where we hung out with the hippies and young backpackers – savouring the healthy snacks and great java’s! At Tonsai Basecamp rooftop terrace. 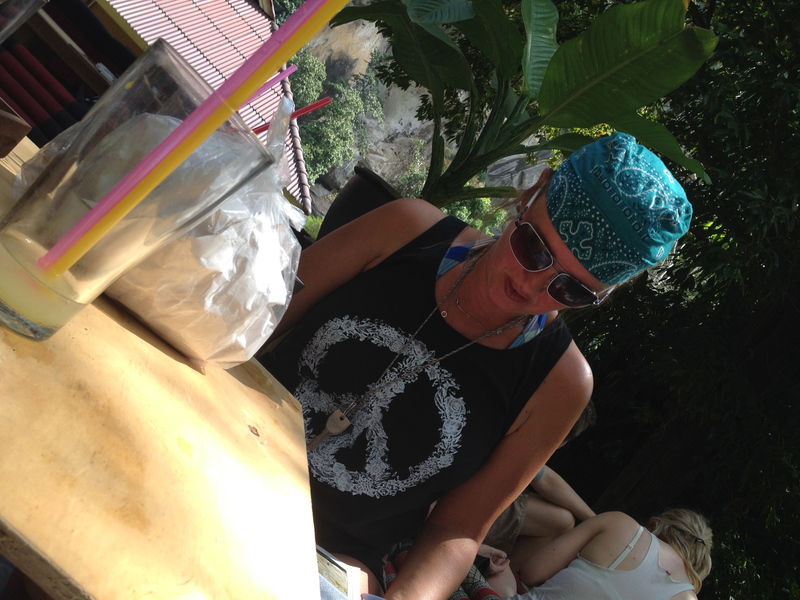 Does it look like I am starting to blend in with the hippy, backpacker crowd? Ao Nang is also an ideal location for boating & yachtsmen (I am working on a collection of boat pictures from around the world, and I surely got my fill here! 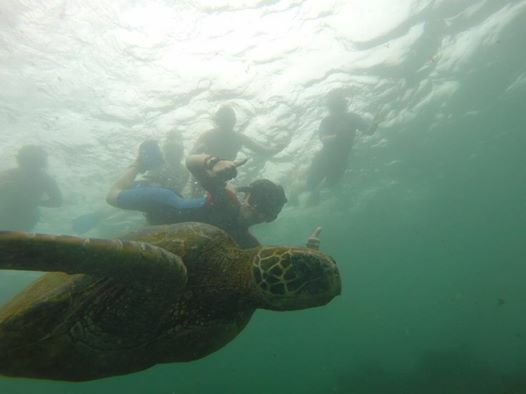 ), scuba-diving and snorkeling. I LOVE the water – swimming, sailing, snorkeling etc. and have always dreamed of scuba diving. 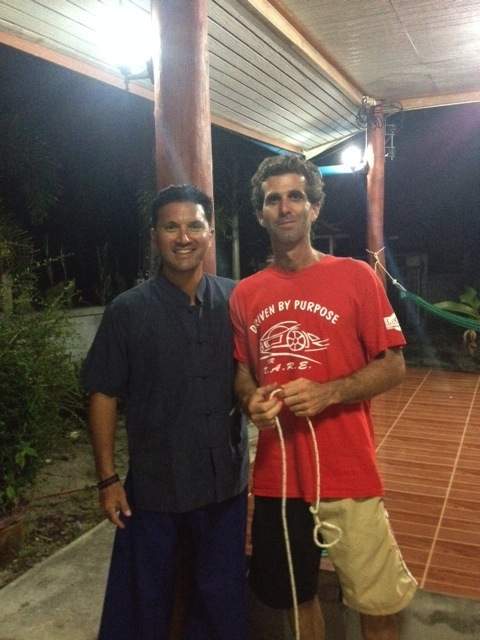 So, I connected with Mike, a local scuba diving instructor who guided me through the P.A.D.I (Professional Association of Diving Instructors), Open Water Diving Course. I studied the 250 page book and was ready to take the exam, but after a first day in the water (in the pool, practicing emergency procedures where I choked a lot and felt completely suffocated), I realized this is sport is not for me. Very happy for having tried something new……This one however, will have to go into the book of “fails” (with a good example for my sons that in life nothing is ever lost if you’ve tried your best)! Michael was kind enough to show us some of the local beaches and less touristy places like e.g. Kluong Muong Beach, where the kids had a great time playing with his kids, Zach “Attack” and Sariya (lovely children that the boys got very attached to! We called Zach – Zach “Attack” as he loved testing out his very good boxing skills on Filou – who enjoyed returning his punches! )– and where we enjoyed the pool of the luxurious Sheraton Krabi Beach Resort http://www.starwoodhotels.com/sheraton/property/overview/index.html?propertyID=1438 , pretending to be guests! As well, we went to Koh Yao Noi Island, a favorite hang out location for the climbers where we arrived by Longtail Boat and had a fun social overnight stay. Here at La Luna Italian Restaurant (http://lalunakohyao.com) Michael & friends thrilled us with a great guitar performance while we enjoyed the restaurant’s delicious pizza. 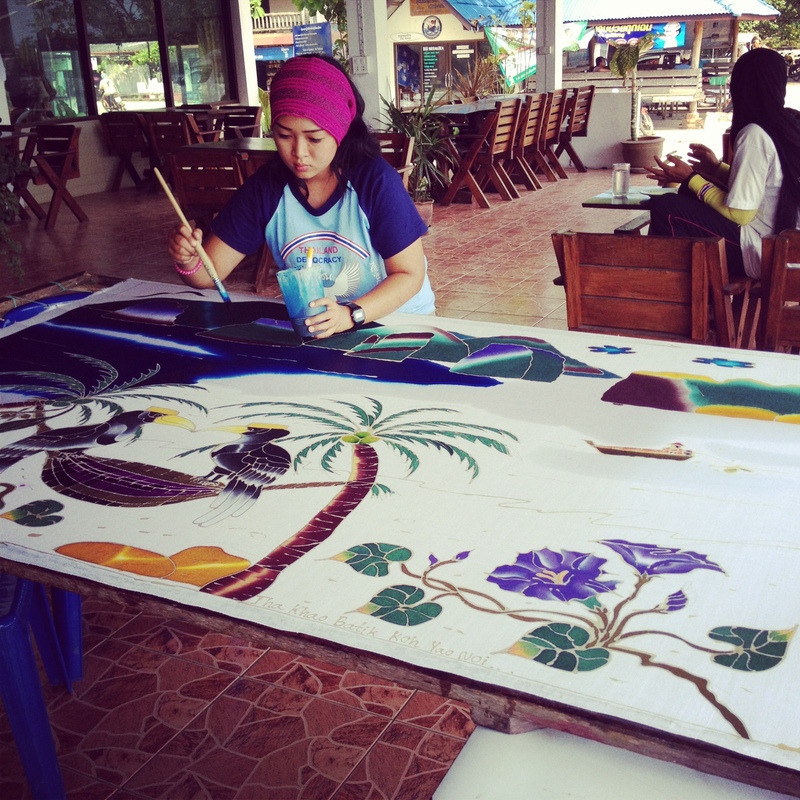 Upon leaving Koh Yao Noi, we learned from local ladies about the traditional style of Batik painting (Batik is a cloth that is painted on, using a manual wax-resist dyeing technique). 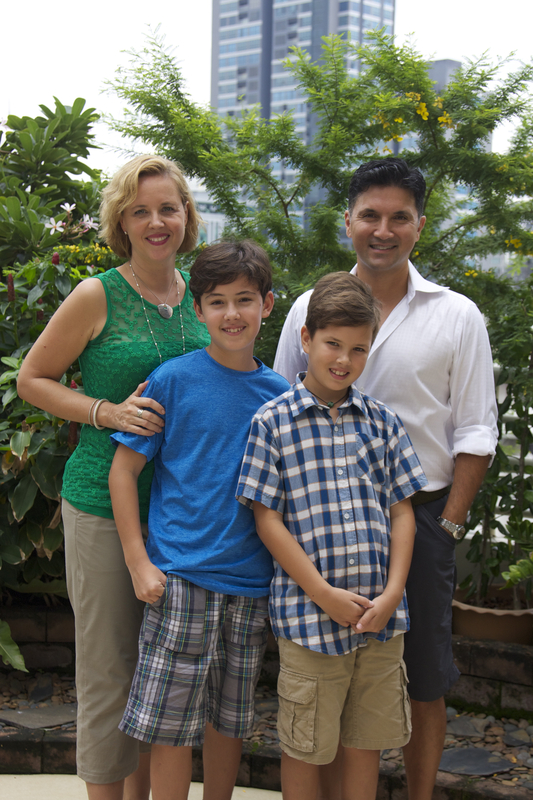 We were extremely thankful to be in sunny Thailand, at the end of December & early January to take in the lovely rays of sunshine and celebrate Christmas & New Year’s here – because our family and friends in Toronto, Canada were battling extreme cold temperatures of up to -30C! (so sorry friends!). Besides a couple of touristy Christmas trees & decorations, there was not much Christmas spirit in Ao Nang, which didn’t bother us in the least bit. For Christmas Day, we planned a day of tropical, island hopping! We rented a private longtail boat, operated by a lovely driver and set course for Hong Islands (a series of 4 gorgeous islands about ½ hour from Oa Nang). 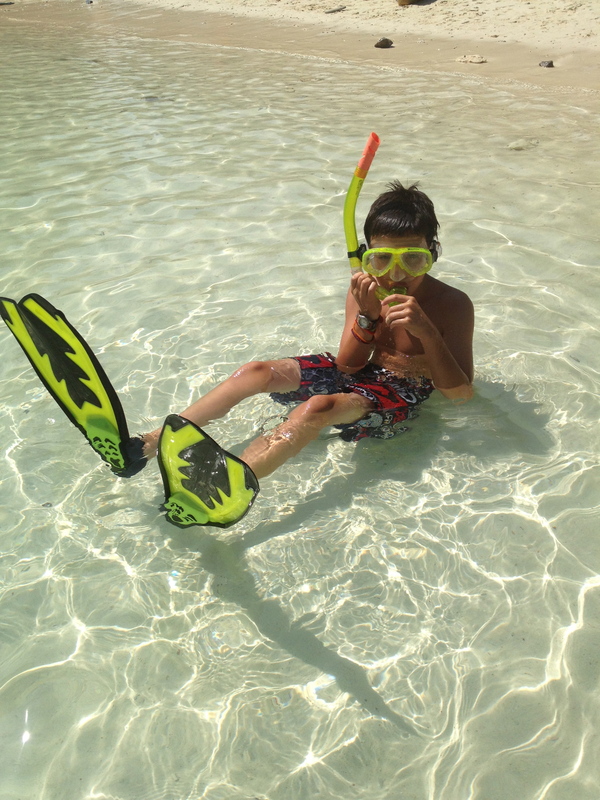 Emile & Filou had received a new set of snorkeling gear that they were eager to try out…and the first Hong Island did not disappoint! 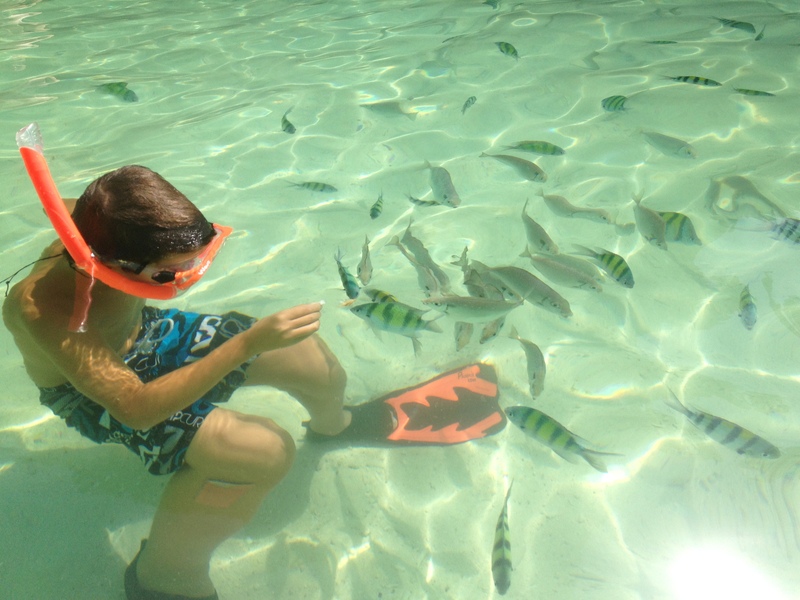 The aquatic life on this main island was incredible and due of the clear, turquoise ocean water – the kids could easily spot and feed the many colourful fish (of course, a little bread always goes a long way in getting the fish to surround you!). From there we went into Hong Lagoon, a stunning, peaceful lagoon where we were “ordered” to jump off the boat to go and collect starfish. It was thrilling how many starfish were located here on the ocean’s bottom – Emile alone must have caught 20 of them! We were a little hesitant to take the wildlife out of their habitat (not quite our thing), but our boat driver kept insisting. We then realized he wanted to put them all over our bodies to take a crazy picture…and fun it was so we made it our Christmas shot to send to friends and family! 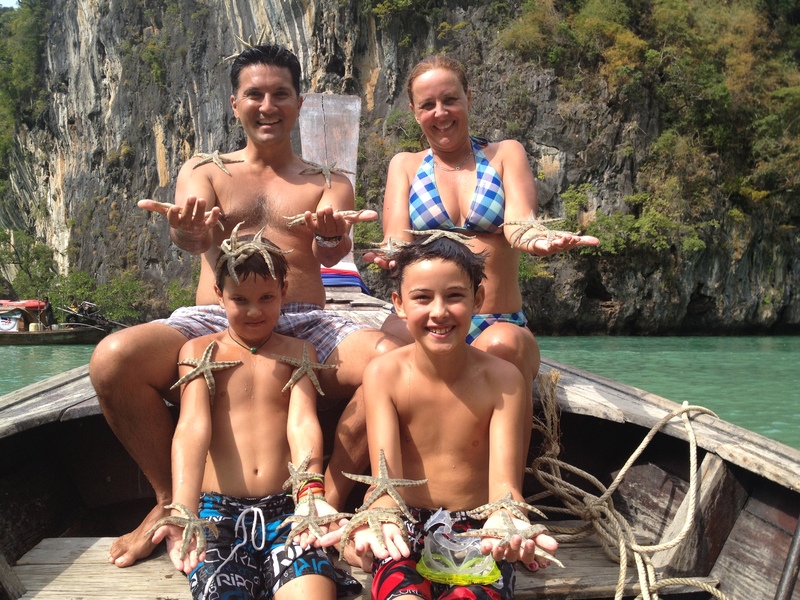 Collecting starfish in Hong Lagoon…fun Christmas picture! From there, we went to Lading Island – which was frankly a bit overcrowded so we didn’t stay long. It did have a great tree rope so the kids got some of their energy out by making crazy jumps! Crazy monkey on a rope! Lastly there was Phak Bia Island where we where the only tourists which was quite refreshing (due to their stunning natural beauty, the Thai Islands have unfortunately become quite overcrowded)! The kids played crazy games in the water and tried an incredibly sour, local fruit – after which we took a nice breezy boat ride back to Oa Nang. All in all, a fantastic Christmas Day! Breezy boat ride back to Ao Nang, Krabi – in local style with Thai wrap-around pants and bandanas! For New Year’s, we had promised the children that they could stay up till midnight – a first for them both! Firstly, we headed to the main strip of Oa Nang where the locals had set up all kinds of food and fun game stalls (the choice was yours – a bowl of crickets or other local creepy crawlers – or a large crispy pancake with nutella!). The kids had great fun playing with local Thai kids on a large jumping castle and we all enjoyed a local entertainment show – where little girls and boys from the nearby school were performing dance and song routines (in rather provocative clothing)….but very sweet! From there, we went to play some pool in the Luna Bar, a fun establishment on the beach where Emile and Filou had their first sip of beer (I know they are a bit young, but it was just a little crazy thing for New Year’s… and better not to make alcohol a taboo in M.H.O)! 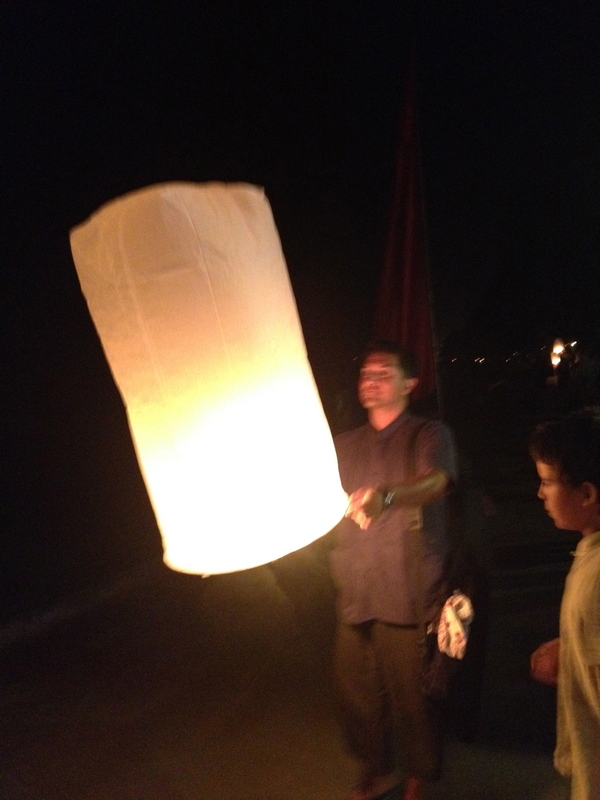 From there, we walked onto the beachfront to partake in the local tradition of lighting a large lantern and releasing it over the sea for a year of good luck! It was a delicate operation…our lantern almost crashed in the water – but Emile saved the day by putting it back over the fire to properly burn & fill with gas. From there, it took off beautifully and together with all the other lanterns, turned the midnight sky into MAGIC! It was then that fun music tunes were starting to blare and the countdown was there. It was at that moment that I felt intense happiness, and thankfulness for our beautiful trip & family– looking out at this gorgeous sky (now filled with magnificent fireworks)…. 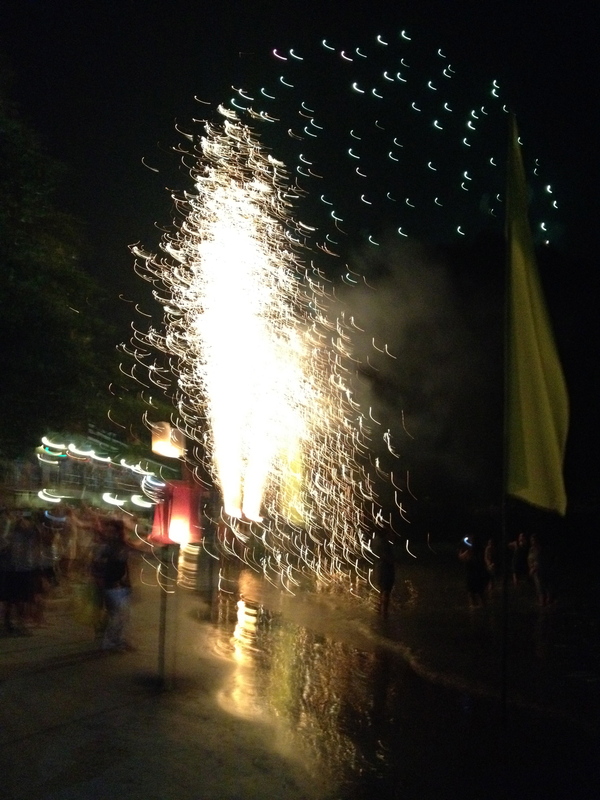 So, I danced my way into 2014 (somewhat to the dismay of the children who thought their mom was rather crazy for dancing on the beach – while others watched. Honestly, I didn’t care – I was having a great personal moment of gratitude and fun!). But we still have some time to enjoy you Thailand, as we are off to Bangkok and Chiang Mai to meet up with the grandfathers: Jichian and Opa here we come!